Can you find love in Love, Virginia? Is there inspiration in Inspiration, Arizona? Wisdom in Wisdom, Montana? It is 1995, and young author Brad Herzog wonders if the cynicism of his generation reflects America or merely misjudges it. So he and his wife empty their bank accounts, pack everything into a Winnebago and set a course for the fine print of the atlas. The road takes them to Triumph, Louisiana, where they find a community twice destroyed by hurricanes and twice rebuilt. In Justice, West Virginia, half the population descends from the Hatfields and McCoys. Faith, South Dakota is a hailstorm, a grasshopper plague and a religious debate. Harmony, California is up for sale. What began as a literal search for the small places on the map becomes a figurative examination of virtues lost amid disillusionment. 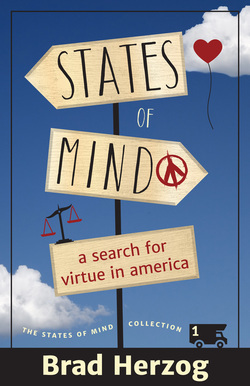 Equal parts whimsy and wonder, STATES OF MIND eloquently reminds us that large insight is the amalgam of small discoveries. Learn about SMALL WORLD (book 2) and TURN LEFT AT THE TROJAN HORSE (book 3).